« Affordable Surrey Condos for Sale at The SoHo Apartments by Blexo Developments – Energy Efficient Surrey SoHo Condominiums Now Selling – Win a HONDA CIVIC! The Hub on Fraser Surrey Condominiums Launching! Centrally located at Fraser Highway and 138th Avenue in Surrey real estate market, the Hub on Fraser condo development is a 4 storey Surrey condominium project that puts you a stone’s throw away from all the shopping you want, SkyTrain and a wide range of educational, cultural and recreational options for its residents. The pre-construction Surrey Hub Condos on Fraser Highway will offer a limited number of one hundred and eight pre-sale condo residences with floor plans that range from one bedroom suites to spacious family sized two bed and den layouts. The four storey pre-construction Surrey Hub Condos on Fraser will present craftsman style architecture that is both sleek and inviting and will feature contemporary finishing details throughout. For more information about this incredible new Surrey real estate development at the Hub on Fraser Highway condos, please visit www.thehubonfraser.com or call 778.278.6677 to priority register. UNDER CONSTRUCTION and pre-sales will be starting up soon, so stay tuned, register online and get ready for the best value in town! Life. Plug into it. Feel the energy, connect with vitality, celebrate the freedom of knowing who you are and what you demand in life. 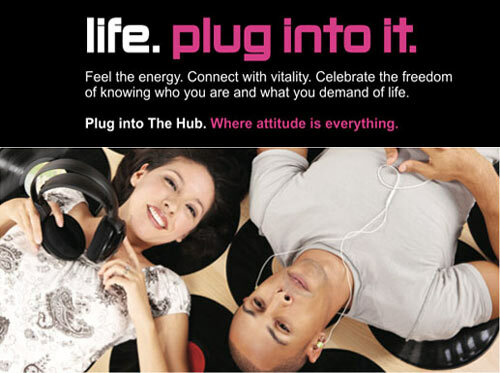 Plug into The Hub on Fraser Surrey condo development where attitude is everything! Urban life here at The Hub Surrey condominiums for sale is all about choice and convenience. This unique Surrey condo real estate development opportunity is part of the new urban lifestyle that you can get in this beautiful and growing city. In fact, everything that makes life great is just minutes away … walking distance from the new Surrey Hub on Fraser Condos! Stay local to pick up some organic produce or fresh flowers for your loved ones or you can just jump on the convenient SkyTrain and get to downtown Vancouver in 20 minutes. You can relax and go for a walk or bike to the Green Timbers Urban Forest or jog through the large Holland Park neighbourhood. Fitness centres, recreational activities, local services and amenities are so close to the Surrey Hub on Fraser condominiums. Not only are local conveniences close by, but educational facilities and schools are also nearby the Hub on Fraser Surrey real estate development. Expand your knowledge at the SFU Surrey campus or go to the Surrey Public Library. Also, the Surrey Art Centre is just steps away in addition to entertainment, movie theatres and nightlife. The best shopping and dining are also close by as are big box retailers so that you can save big on every day items. The new Hub Surrey condos for sale are surrounded by retail heaven, perfect for singles and couples alike. For those who enjoy the occasional latte, there are tonnes of local bistros and coffee shops that line Fraser Street at The Hub Surrey condos for sale. Choice and convenience are definitely on your side if you choose The Hub on Fraser as your new home. As the marketing explains, the new Surrey Hub condos is an urban savvy development that is distinctively West Coast/Yaletown/urban chic style in addition to very appealing to look at. As far as the interiors are concerned, the new Surrey Hub on Fraser condos feature large and airy spaces, hardwood laminate floors, stainless steel appliances, en suite bathrooms and granite counters to name a few items. The attention to detail is seen throughout these new homes at the Hub Surrey which includes award winning GBL Architect design and custom exteriors that have pleasing colours, vinyl siding with shingle, hardy board and batten accents. Other features of the Hub on Fraser Surrey condos for sale include electric fireplace mantels, crown mouldings, laminate floors, durable metal garage doors with automatic openers/remotes and generous use of large quality vinyl windows to allow for an abundance of natural light throughout the homes. Also, there are large covered porches and decks, 25 year guaranteed Duroid roof shingles, berber carpets and solid wood accent trims. Residents have access to a community Amenities Area here at the new Surrey Hub Condos on Fraser that includes a full kitchen, electric fireplace, fireside lounge, powder room, patio garden, fully equipped fitness gym and guest suite too. The premises will have designer landscaping throughout, a childrens’ play area, low maintenance exterior, Rain Screen Building Envelope System and secure visitor parking. All homes at the Surrey Hub Condos will have the latest in construction technology that includes Rain Guard Protection, electric hot water tanks of 40 gallons, energy efficient windows and designer low flow cost efficient fixtures. In addition, homebuyers at the new Hub Surrey condos on Fraser can enjoy the 2-5-10 year home warranty on their big purchase in addition to additional concrete sound proofing between each floor. There are additional storage lockers and bike lockers on site in addition to secure gated underground parking garage. There is also a water sprinkler safety system, security system pre-wiring, and easy access key fob security system too in addition to 24 hour surveillance cameras and motion activated recording throughout the Hub on Fraser Surrey condominium building. Here is a quick list of some of the standard features at the new Surrey Hub on Fraser condominiums. There are two colour schemes to choose from in addition to four inch traditional baseboard detailing in all rooms, attractive light fixtures throughout, laundry closets with washer/dryer (included) and 2 inch Faux wood blinds. Most of the floor plans at the Hub on Fraser Surrey real estate development have large entertainment sized patios and balconies too. The kitchens at The Hub on Fraser condos will have stainless steel energy efficient appliances that include OTR microwave, fridge, dishwasher, and self cleaning range in addition to custom cabinets, double compartment stainless steel sink with garburator and quality granite or silestone counters. Also in the kitchens are drop light fixtures, low flow cost efficient fixtures and ceramic tiled backsplashes. There is extensive pre-wiring for TV, cable, internet and phone lines throughout the homes. In addition, the spa like master en suite and bathrooms here at the new Surrey Hub on Fraser condominiums will feature designer bathroom accessories that are low flow and cost effective in addition to full width counter mirrors with light bars and relaxing soaker tubs with tiled surrounds. Other major bathroom features a the new Hub on Fraser Surrey real estate development include ceramic tiled floors, under mount sinks, granite/silestone countesr and spacious walk in closets. Coming Soon to the Fleetwood Surrey real estate market is a great collection of affordable Surrey condos at The Hub on Fraser Highway. Starting at an incredible pre-construction pricing, the Fleetwood Surrey Hub on Fraser condos will only feature 108 select suites that range up to 1,000 square feet. The smaller studio plans are around the mid five hundred square foot range. From one bedroom to two bedroom plus den floorplans, the Hub on Fraser Surrey condos are sleek and sophisticated and are located at 13897 Fraser Highway, Surrey. A different kind of project, a bit different design and a great price point. 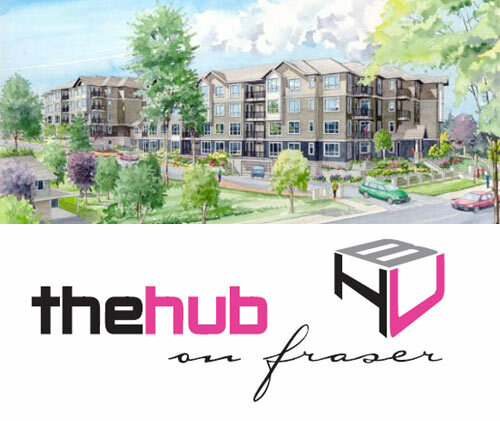 Introducing the new Hub on Fraser Surrey condo project, located in one of the most trendiest locations possible. The new Surrey City Centre district is all about urban, sophisticated living in a vibrant new neighbourhood that is set to become one of the most sought after places to live and work in the Lower Mainland. The Hub on Fraser Surrey condos is a new project that will feature 108 contemporary condominiums for sale with great value based pricing. The affordable and extremely livable homes offer everything that you would want that include lavish crown mouldings, upscale stainless steel appliances, designer faucets, granite countertops, maple cabinets, two inch faux wood blinds, as well as hardwood laminate floors and ceramic tiling. Many of the two bedroom floorplans at the Surrey Hub on Fraser condos have two full bathrooms as well, making them very unique. Also, the windows and the outdoor living spaces are beyond enormous and there are angled fireplaces, premium kitchen backsplashes and the luxury of a community guest suite. Not only that, but another great amenity at the Hub on Fraser Surrey City Centre condos is a great gym. Close by are Holland Park and Green Timbers Urban Park in addition to many other entertainment and recreational options. If you like shopping, there is tonnes close by as well. This is in addition to the SkyTrain station, the SFU and Surrey Hospital and much more. The presentation centre for the Hub on Fraser Surrey City Centre condos opens July 17th and will be located at 10239 King George Highway. Already under construction, the Hub on Fraser Surrey condos are located at 13897 Fraser Highway, Surrey.